ScanTech Sciences, Inc. announces that its first Electronic Cold-Pasteurization™ Center is slated to open and be operational in late Spring 2018. The initial phase of construction – which involved transforming an existing 100,000 square foot warehouse into a temperature controlled cross-dock facility – is nearing completion. The Rio Grande Valley Electronic Cold-Pasteurization™ Center will treat produce traveling to and from the United States and Mexico, serving growers, packers, distributors and retailers across the supply chain. ScanTech Sciences is integrating cold chain best practices with cutting-edge technology for yard management, dock scheduling, conveyor control automation, handling, storage, and finishing to be able to safely and efficiently process 30 pallet loads at the case level in less than 40 minutes. The facility manages five temperature zones with high density push-back racking system to accurately store product in proper cold chain requirements. The pallets moving through the facility are managed by voice-commands to allow for faster loading, storage, retrieval, and finishing services for efficient through-put. In addition, there is over a mile of conveyance to effectively move product through the treatment facility enabling processing of 120-160 cases per minute with proper and efficient sortation while maintaining low vibration and a low grade pitch throughout the system. Leading operations for the Rio Grande Electronic Cold-Pasteurization Center™ is general manager Randy Main. Mr. Main will work to further the company’s mission to improve produce quality and safety, helping the entire food chain deliver fresher, higher quality fruits and vegetables. As the new General Manager, Randy Main brings over 40 years of food industry operations including running the world’s largest candy cane manufacturer in Reynosa, Mexico and working in leadership with The Hershey Company in the United States, Asia, Europe, and Latin America. 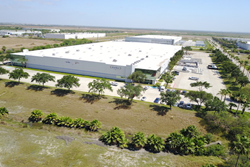 “Randy’s extensive experience leading operations for food facilities will ensure that the Rio Grande Valley ECP™ Center not only runs efficiently, but also delivers on our promise to deliver premium produce for our customers,” said Chip Starns, ScanTech Sciences Chief Operating Officer. ScanTech Sciences will provide its advanced Electronic Cold-Pasteurization™ treatment as part of an integrated program that includes logistics services such as expediting border crossing and USDA processes, product traceability, smart palletizing, and information services such as document management and shipment visibility. The company is currently hiring for over 150 positions for its Rio Grande Valley ECP™ Center.